Every December when we bring the boxes of Christmas decorations down from the attic, I look forward to seeing little friends from years past. 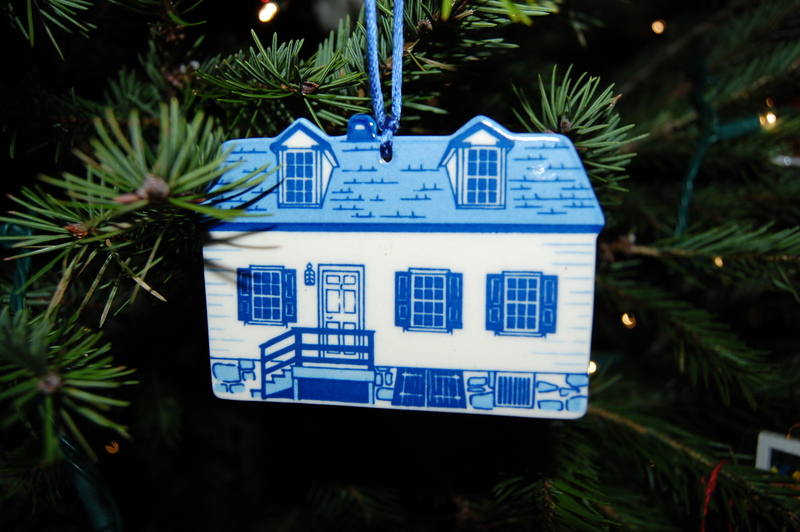 These would be the tree ornaments and other small whimsies – fancy and plain, big and small, tattered and pristine. Collected over forty years, they tell many stories. The most meaningful ones are those that have been given to us – or specifically to me – by friends, by relatives, or even by casual acquaintances. As the years have passed, some of those people have died, some have grown up, others have weathered life’s rocky path with grace, while some have grown old and older – or sick and sicker. 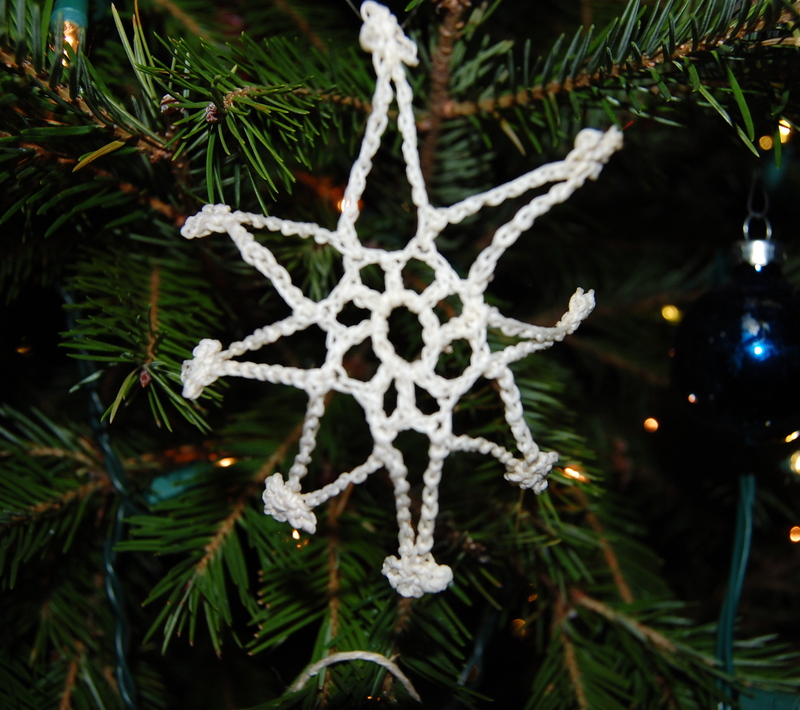 My sister crocheted fancy snowflake ornaments for us very early in my husband’s and my marriage. Those snowflakes are now yellowed and bent, but every year they go on our tree, where a certain little cat always finds them and somehow picks them off to chase around the house. No wonder they are a little tattered! Our tree would not be the same without them. Of course, I think of my sister every day, not just in December. Somehow these little cotton snowflakes remind me of how far we have both come . . . Merry Christmas, Barbara! A little wooden Scandinavian Santa was given to us one Christmas long, long ago by a thoughtful and fun friend named Judee. This happy little fellow does not know that Judee died of cancer at a much-too-young age. But in his smiling face, I see and remember the beautiful glow of our old friend. 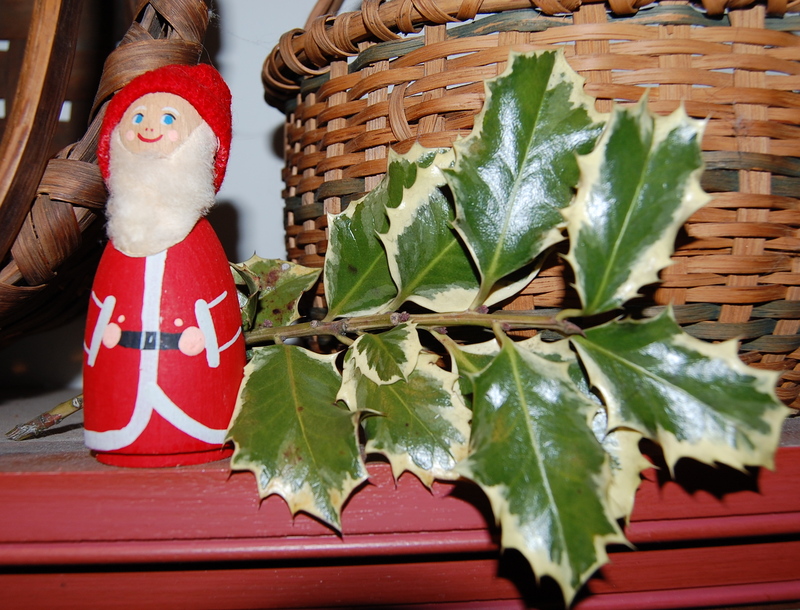 This little Santa finds a spot in my kitchen each December. The Dressmaker’s House ornament hung on a display tree in a museum shop, out of context on one hot summer day years ago. I spied it, but was paying more attention to my children as they looked at all the goodies before them. Their grandmother was “treating” so they wanted to find something special to take home. I don’t remember what they chose, but I do remember that my mother-in-law wanted me to have this ornament – and quietly purchased it for me. I so love this little depiction of the dwelling of a kindred dressmaker from another era. So – I’ll be taking a deliberate couple of weeks off from my blog, but will return in early January. For those of you who celebrate Christmas, may yours be filled with memories, both old and newly hatched. For everyone, I wish you Happy Everything during this season of hope and renewal. What a sweet, dear post, Karen! I feel the same way when I decorate for Christmas and bring out many old and tattered ornaments — felt cats and bunnies that my father bought for me 60 years ago in Austria, dough ornaments made by my children, etc. Not a decorator tree but meaningful to us all as we recount the stories as we place them on the tree! Thanks so much for sharing. I’m so glad you enjoyed this post, Cissie. Hope you had a wonderful Christmas! Merry Christmas, Karen! It’s your grandson’s first Christmas, right? Actually, granddaughter… And we had a wonderful Christmas. Hope you did, too. Sorry – granddaughter! I knew that 🙂 Happy New Year! I too have a tree that is rich in memory but not designer…..by any means! Merry Christmas to you too, Karen. Thank you Karen. Your post was very precious to me. I have a few of those old, yellowed snowflakes on my tree also. Knowing that we have shared all these years is very special and I am proud of where we have both ended up. Enjoy this year’s extra special Christmas. We did! So glad you liked this post! What a wonderful post! Merry Christmas! I love this post, Mom! You embody the spirit of Christmas. Nathaniel and I are so lucky to have you as a Mom; our memories of this time of year are so wrapped up in you and all the traditions you’ve built for us. I love you. And thank you in advance for a very special Christmas, Aida’s first! It was special, wasn’t it?? I love you, too!